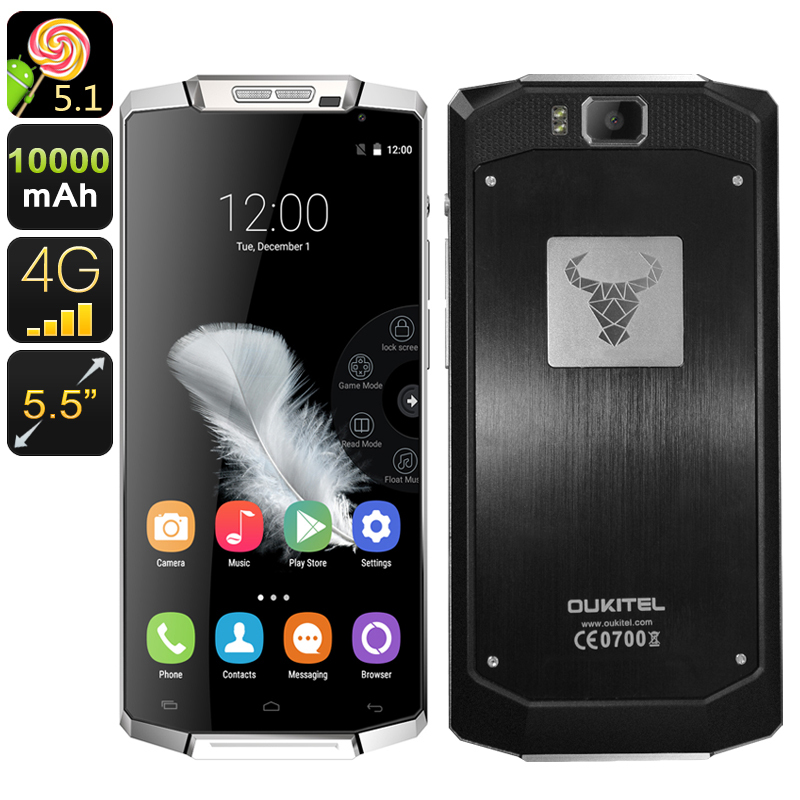 Successfully Added Oukitel K10000 Android Smartphone - 10000mAh Battery, Reverse Charge, Quad Core CPU, 2GB RAM, 4G, Dual SIM to your Shopping Cart. Boasting a 10 day continuous talk time the Oukitel K10000 demands a closer inspection. With a truly gargantuan 10000mAh battery this Smartphone promises to shatter the idea that Smartphone’s need charging every day and is certainly the largest battery phone available to date, shattering all the competition by a considerable margin. Not only can this phones battery keep it running for 10 days of talk time or up to 50 days in standby but you can also use it to recharge your other electronic gadgets. Just plug an OTG cable into the phone and use it to power up your music player, smart watch or use it to power up a friend’s phone. It couldn't be easier. With a Quad Core CPU and 2GB of RAM this phone can easily run with the pack so won’t disappoint when it comes to performance. It can handle all the daily apps you could need as well as plenty of games and movie viewing. The large 5.5 inch screen qualifies this phone as a Phablet and with 720p resolutions the bright display will bring great picture quality with a nice depth of colors and contrasts. The Phone packs 16GB of internal storage and its micro SD card slot offer support for an additional 32GB of space. Dual SIM card slots allow for the management of two numbers so this one device can manage your work and personal life with total ease. Each SIM slot supports the 4G networks so you will also be able to access faster cellular data connections making it easy to steam HD content to and from the phone. Running the efficient Android 5.1 OS and with smart wake and gesture sensing functions the Okuitel K10000 is easy and intuitive to use with plenty of shortcut options to open your favorite apps and loads of customizations available to put your own layout on the device. The Okuitel K10000 Smartphone comes with a 12 months warranty, brought to you by the leader in electronic devices as well as wholesale Android phones..